The Partnership award is given to a project which ref lects the importance of effective inter-agency collaboration and partnerships. The 2018 winner is eThekwini Municipality and its unit Invest Durban. 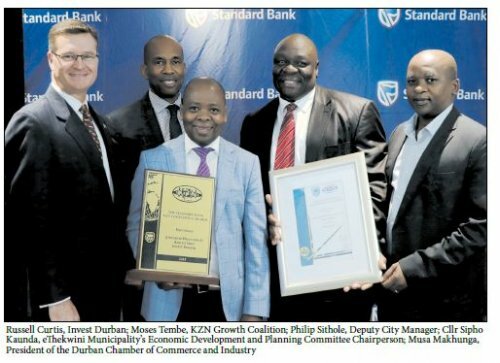 Russel Curtis, Head of Department Invest Durban reflected, "It is an honour, as the city of Durban's leadership, to be in partnership with our business friends and business leaders in Durban. Tonight, is a great reflection of that partnership and the great work together." Over 45 people from business and government - the biggest combined regional delegation ever to travel on an investment roadshow - recently visited the United Kingdom (UK) to promote the province of KwaZulu-Natal. as a premier investment destination, whilst showcasing a diverse range of flagship, investor-ready projects through a series of organised business-tobusiness engagements. attributed the interest, "to the opportunities the region has for both small and large investors. The 65+ B2B meetings concluded on the Friday alone set a new record from which additional investments will flow into our economy." Invest Durban will now be assisting these businesses, and others from both the UK and Durban who couldn't attend, to make follow ups in the coming weeks. This increased bilateral trade and investment will be ensured to benefit all communities in both the United Kingdom and Durban, KwaZulu-Natal.